* Do you have difficulties understanding what your baby wants? * Is your little one crying all the time for no apparent reason? * Would it not be great if your baby could TELL YOU what he or she wants? · Reduce the Heartbreaking Crying! · Do Away With Tantrums! We parents used to think that this parent-child torment is a necessary evil you have to endure until your baby is old enough to speak. Wrong! Your baby can tell you all what he or she wants and more by simply using these easy-to-follow Baby Sign Language illustrated charts. You don’t need to wait till your baby is a toddler –with the baby sign language posters at hand, you can start communicating as early as 6 months! Can you really afford not to give your baby (and yourself!) these benefits? 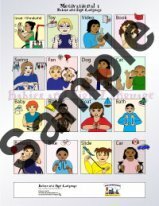 Our Baby Sign Language *10-Poster Set* can save you from a lot of early parenting trouble and it offers unique parenting experiences you simply can’t have without it. You too can create similar bonding memories with your baby through Baby Sign Language. Now you can ask her and get a REAL answer! Gone are the days where you try to feed your baby, but find your child actually has a bellyache! Understand what's going on with your little one and fix it fast! No more guessing around whether your baby is in pain or just plain bored. Understand what's TRULY going on with your little one and fix it fast! And it isn’t just you who will understand what your baby wants. Your Baby Will Be Understood in Every Daycare or Childcare Facility Nationwide! Our baby signing poster signs are accurate and universally recognized, created by American Sign Language experts, who have worked in the field for decades. With us, you KNOW you are teaching your baby approved and widely understood signs. 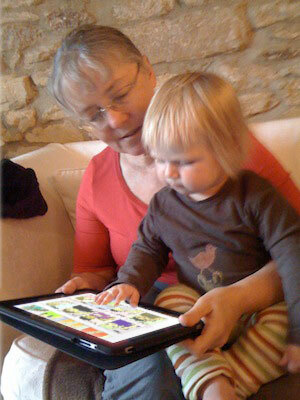 Your child will be actually learning a REAL LANGUAGE at the age of just a few months! You don’t want to teach your baby fake signs someone made up to take money from you. 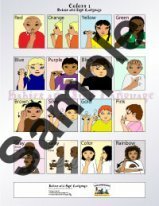 Our Baby Sign Language *10-Poster Set* includes ONLY AUTHENTIC SIGNS. OUR signs are ALL recognized by leading experts and top sign language universities, such as Gallaudet University, NTID, and CSUN. BEWARE: Many OTHER Baby Sign Language posters are SCAMS!!! What's wrong with made up signs? When you use made-up signs, these are only recognizable by you and your baby. This hurts your chances at finding daycare, baby sitting, and even hospital care, and other child care places who will understand your baby's wants and NEEDS. It is like teaching your child a useless, fake language. 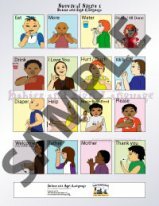 For the same money and effort you can TEACH YOUR BABY A REAL LANGUAGE with our Baby Sign Language *10-Poster Set*and enjoy permanent, tangible benefits! Research shows that: Babies prefer to look at other babies in photos and illustrations. 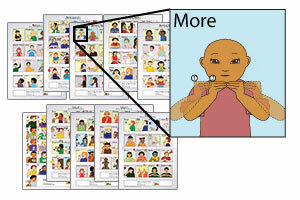 This is why we only use faces of babies and toddlers in our Baby Sign Language *10-Poster Set*! Your baby will empathize faster with these pictures, thanks to the amazing illustrations. The babies in our posters have happy smiles and emotions that engage your baby every time he or she looks at the vivid images! We use many bright colors in our illustrations to grab your baby’s attention and make the whole process of learning more fun. 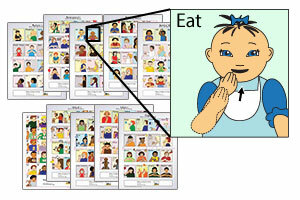 Our Baby Sign Language *10-Poster Set*have been widely tested by thrilled parents and eager babies. It’s a fact that babies love viewing the pictures and easily grasp the illustrated signs. 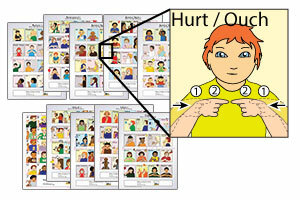 Parents introduce the Baby Sign Language *10-Poster Set*as a new toy and signing as a new interactive game. By making our posters that fun, we have ensured that your baby will be drawn to the images and be eager to try out the signs with mom and dad. After a very easy learning curve, the game turns into a useful tool! Your baby will start signing for what he or she wants and needs, giving you clear clues and actions about what to do as a parent. Understand What Your Baby Needs FAST! You don’t want to waste time looking for one useful sign among thousands! There is always time for abstract thoughts and advanced words later. First of all you need to learn the absolute basics. This is why our posters are arranged by activity, making it easier to find that sign you're looking for. You don’t want to browse through hundreds of pages and videos every time you need to find the sign for “hungry” or “diaper”? With our organized system, you will find that absolutely critical sign within seconds! Since our system organizes the signs into activities, you just place the correct poster in the room where specific activities are taking place and you and your baby will be able to refer to the signs when you need them! When you understand what your baby wants you react much quicker to their real needs. This way your baby feels safer and less stressed! By creating this trust between you and your young one, you ensure that your baby will have more pleasant behavior now that will carry on into the future. With these signs, your baby will quickly understand that there is no need for crying and tantrums when he or she is being understood. When your baby knows that you always get it right and you are there to fix things fast, a strong type of parent-child bond is being forged. 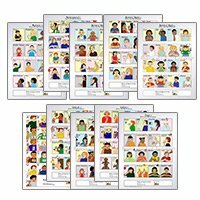 With our Illustrated Baby Sign Language Posters, you can be closer to your child than it was ever before possible! 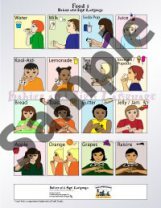 Start Learning More Baby Sign Language Today - Click Here to Get Poster Set! 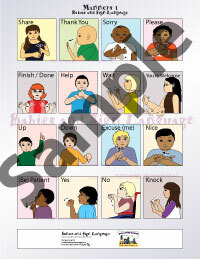 You can take our Baby Sign Language *10-Poster Set* everywhere! 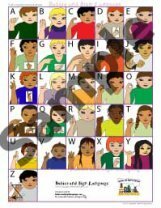 These specially made Illustrated Baby Sign Language Posters work on your favorite mobile device! Get beautiful, CLEAR resolution posters on your mobile device, so you can bring ANY sign with you for when YOU and your BABY needs them. Easily access the posters via your iPad, iPod, iPhone or Android. Just touch your screen and you are ready to go. Start truly understanding your baby today! What types of signs are included on our posters? These are the basic signs that pretty much every baby first uses, which will help you communicate some important concepts to your baby, such as: "Eat", "More", "All Done", "Mommy", "Daddy", etc. Once your baby has learned the first basic words you can move on to this poster, which includes several more important signs. This poster includes signs such as: "hot" "cold" "play" and so on! This is the last of the basic survival posters and will teach your child the last important signs he or she absolutely needs to know. Use this poster third and conclude teaching the essential survival signs to your baby. This poster includes all the letters of the alphabet as signs. Give your child a head start on reading before the age of one! Did you know that babies can finger-spell? Get a head start on educating your baby about the world around her long before it's time for school! See what your baby really loves to talk about! Giving you baby conversational skills allows him or her to grow up to be more charismatic. Teach your child how to communicate preference and individuality. With our Colors Poster you can show you baby how to name and tell colors apart. Bathing can be a horror for many parents if their kids are afraid of the water or fear of drowning. With our Bathtime Poster you can explain exactly what will happen to your baby and make bath time double as fun! Want to know what your baby really wants to drink or eat? If your baby prefers to drink juice over milk, or it wants a banana, it will let you know after they learn the signs on our Foods Poster. Stop those nasty food tantrums once and forever! It's never too early to start teaching your young one how to be polite. With our Manners Poster you can teach your little one to be a charming example of good upbringing. Babies are fascinated with animals! Dog, Cat, Fish, Horse and more! Your baby will be familiar with nature’s creatures in no time. 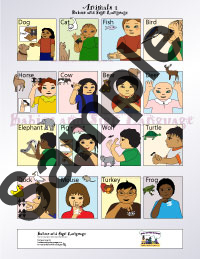 ORDER this Baby Sign Language Poster Set now and you'll also get 3 bonuses at no extra charge! Every moment of signing with your baby is precious! 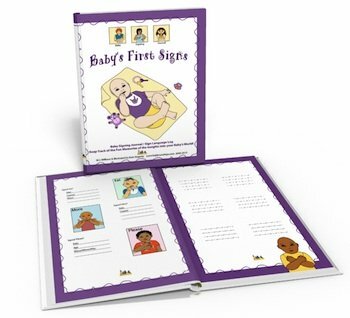 Record your signing memories in this adorable and educational Baby's First Signs journal and keep those priceless moments alive forever. Good or Bad, Hot or Cold? Explore opposite meanings with your child! Encourage their curiosity about what is similar and what's different in their world. Improve their vocabulary, right up until it's time for kindergarten, using opposite signs! Take the next step and move from single signs to basic sentences! Teach you little one how to form simple sentences like: "I Want Milk", "My Stomach Hurts" or "Pet the Dog". This way your baby will be able to fully communicate with you! Now your can see your baby or toddler signing "I Want Milk" or "My Stomach Hurts" or "Pet the Dog" -- fully communicating exactly what she wants! OUR OUTRAGEOUS 100% Money Back Guarantee. 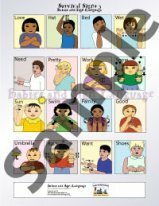 We are so confident that our product will leave you 100% percent satisfied that we offer this insane guarantee: If you don't like our Baby Sign Language *10-Poster Set*, you can ask for ALL your money back. No strings attached! Want to know what’s even crazier? There is no set number of days, months or years to try this! No extra hassle or conditions to follow! 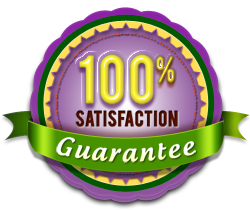 This is just a good old fashioned 100% guarantee, because our product is just THAT GOOD. 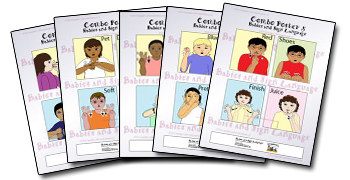 You buy our Baby Sign Language *10-Poster Set*with NO RISK and ALL THE BENEFITS! Start Signing With Your Baby Today! My daughter reached the age when she would throw temper tantrums often because she often wanted things that I couldn't figure out. She would try so hard to tell me what she wanted, but she couldn't. I purchased this set of posters because I wanted to teach her how to communicate her needs to me. Here's a picture I took of her with one of the posters - she LOVES them! 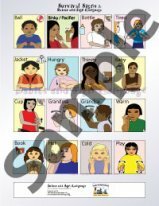 This set of posters really helped my daughter and I learn to communicate with each other. I really liked how the posters were easy to understand and follow. The posters are the perfect size. I definitely have noticed a significant reduction in the amount of temper tantrums my daughter has now that she has the ability to communicate her wants and needs to me and other family members. I feel like now her and I have more time to bond because I spend less time trying to figure out how to calm her down from her tantrums. I would highly recommend these posters to anyone with young children! Hi MJ, my name is Charisse. 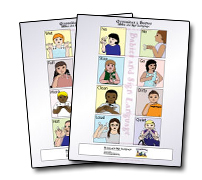 As an expectant mother and godmother to a child with hearing and speech impediments, I have been searching for learning aids for sign language that were simple enough for children to understand. I can absolutely say that they [posters] are well worth every penny!!! They are colorful and relevant with simple graphics that adults and children can appreciate. We gave these to our godson as a present and he loves them. They have helped him communicate in ways that were very difficult for him previously. When we are working with him, he actively points to the poster and can identify and distinguish between the different signs with ease. He loves when we work with the posters and seems to think it's a game he enjoys it so much! We incorporate speaking with the signing and he even tries to talk along with us. We also learned quite a bit from them as well, like gestures for diaper-changing and breastfeeding. There are different posters for different rooms! They are very well thought-out and relevant. I would highly recommend these [baby sign] posters. They have been an excellent resource for our respective families and could benefit even those who do not have any hearing or speech limitations as they open up a new avenue of communication for us all. We are planning on using them with our son when he is born and can understand, regardless of his abilities to speak/hear as this has been an invaluable resource for our godson! -C. N.
I wanted to tell you that we are very happy with our purchase. I can't believe the guarantee lasts for so many years! After we purchased this poster set with the gift bonuses (thank you! ), I realize that I paid much LESS for this product than I have at a few other baby sign language sites. Our baby LOVES these colors, pictures, they keep her attention, and make her smile! 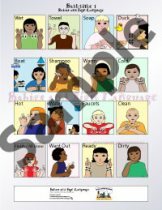 You asked me what the obstacles were that would have prevented me from buying these baby sign language posters… Again, honestly, I first doubted in the product working efficiently for my child. Because we had such a hard time following the other signs from a few other baby signing websites, we expected the same here. I'm VERY happy to say that we were wrong this time, and my doubts weren’t necessary because the product did wonders with my daughter! Very glad that we tried once more. As I said, she LOVES the pictures (of the other babies and toddlers), and even points to the very helpful directional arrows to show ME how to do each sign! This was perfect timing because we almost gave up with trying to find a baby sign language program/product that we could clearly understand.